Find out more about 18004memory. Check our our outstanding credentials. That's a lot of happy customers! Registered with the PA BBB. Proof of our continued commitment to you. Modules are manufactured and tested to exceed all specifications in our state of the art, ISO 9001:2008 facility. These are the specifications for this module. More detailed specifications can be provided upon request. The Dell POWEREDGE T410 T610 T710 R610 R710 R715 R815. Will not deliver to a PO box. Australia, Canada and Great Britain. All warranties and guarantees are applicable to original purchaser only. By 1994, it was incorporated as Micro Memory Bank, Inc. The business strategy was and still is to offer the widest variety of memory to our customers. By 1996, Micro Memory evolved into a full surface-mount module manufacturing process, building SIMMs, and DIMMs. In 2001, the Company moved into its new 18,000 square foot facility housing three process lines. It is now one of the premier memory module manufacturers and distributors in the United States. Our goal is to provide service that exceeds the highest expectations of our customers and offer products that are responsive to the needs of the industry. Micro Memory Bank is proud to be one of the few remaining memory manufacturers to still support "trailing-edge" technology. We continue to build 30 and 72 pin SIMMs as well as "cutting-edge" 200 pin Unix based server DIMMs. We also stock a vast variety of original (tier one) memory upgrades from IBM, HP, Compaq, Sun, DEC, and Cisco. Virtually any quantity of modules for any PC, MAC, server, workstation, laptop, or printer is available. The Company's seasoned sales team is able to cater to almost any type of customer including resellers, distributors, exporters, OEMs, VARs, Fortune 500, and government. Design Micro Memory Bank has a wide variety of module designs that include 30 and 72 Pin SIMMs, 144 SO-DIMMs, 168, 184, and 200 Pin DIMMs. Our product-line offers many older form-factors as well as leading-edge modules. Manufacturing MMB's uses fine-pitch surface-mount technology production on its high-speed fully automated lines. The company exclusively uses a "no-clean" solder process and convectional reflow-ovens that are environmentally safe and assure high quality. Micro Memory Bank is ISO 9001:2008 certified. Our active JEDEC membership keeps us abreast with the industry's standards. MMB has an excellent manufacturing quality record for over eight years. Testing All of MMB's products are subject to strict functional testing. Module memory testers can support a wide spectrum of technology from older fast-page mode and more recent DDR technology. Product is tested "at-speed" guaranteeing maximum system performance. Our motherboard system-test process is performed on all newly developed products. It is another way we assure that our production testing exceeds the customers' application demands. Powered by SixBit's eCommerce Solution. 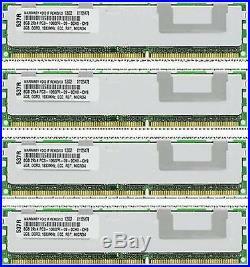 The item "32GB (4X8GB) MEMORY FOR DELL POWEREDGE T410 T610 T710 R610 R710 R715 R815" is in sale since Wednesday, October 19, 2011. This item is in the category "Computers/Tablets & Networking\Enterprise Networking, Servers\Server Components\Server Memory (RAM)". The seller is "1-800-4-memory" and is located in Montgomeryville, Pennsylvania. This item can be shipped to United States, Canada, United Kingdom, Denmark, Romania, Slovakia, Bulgaria, Czech republic, Finland, Hungary, Latvia, Lithuania, Malta, Estonia, Australia, Greece, Portugal, Cyprus, Slovenia, Japan, China, Sweden, South Korea, Indonesia, Taiwan, South africa, Thailand, Belgium, France, Hong Kong, Ireland, Netherlands, Poland, Spain, Italy, Germany, Austria, Israel, Mexico, New Zealand, Philippines, Singapore, Switzerland, Norway, Saudi arabia, United arab emirates, Qatar, Kuwait, Bahrain, Croatia, Malaysia, Chile, Colombia, Costa rica, Dominican republic, Panama, Trinidad and tobago, Guatemala, El salvador, Honduras, Jamaica.